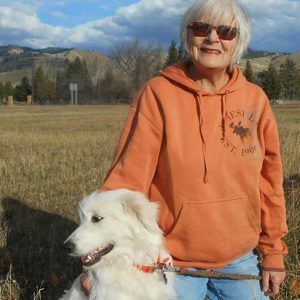 Pam Aunan has been looking out for her Northwest neighbors for more than 30 years, and she’s done so without fanfare in extremely rugged conditions: no running water, electricity, or Internet. What she needs to sustain herself—food, water, entertainment, the tools to do her job—must be packed in on her back, hauled up the mountain in a truck or ATV (if someone can spare it), or air-dropped if she gets really lucky. Her “home” is a 12-foot-square box atop Lookout Mountain, an Idaho Department of Lands forest fire lookout tower in the Priest Lake Ranger District. She has an outhouse at the base of the 25-foot tower, and a propane-powered refrigerator and oven. Aunan is being characteristically understated about the view, which is, in a word, stunning. Breathtaking. Unparalleled. Located west of the Lions Head and north of Chimney Rock, the Lookout Mountain site has a formidable vertical north face and sits at an impressive elevation of 6,722 feet, with vistas of the Selkirk Crest, Priest Lake and Upper Priest Lake. Aunan sometimes invites guests, and welcomes wayward hikers. “The more people who treasure [the lookout], the better,” she said. She does not get bored, said Aunan, who likes to read or knit when not working, and can spend as much as five days on/two off in the lookout. There are actually two structures on site: the metal tower relocated from Packsaddle Mountain in 1977 and topped with the 12-by-12-foot cabin where Aunan works, and a 1929 wooden lookout relocated to the site from Stanley, Idaho, and restored over several years. Last summer, however, the cabin was vandalized and subsequently removed, leaving only the tower. Vandals stole her binoculars—an essential tool—and broke windows, which are the only protection from rain, wind, cold, bugs and even smoke. Smoke is more than an irritant for lookouts: it’s a clue. If the smoke is minimal, it could be the telltale sign of a fire just starting, and should be checked before it mushrooms. The vandalism “felt really bad,” said Aunan, who’s been a lookout since 1986, typically working from April through late November. She also works on fire education and other outreach programs to children, including through the Smokey Bear coloring contest. Aunan has heard there are plans to restore “her” lookout. Regardless, the lookout program is as precarious as some of the old towers themselves as management agencies replace them with aerial spotting, satellites and remote cameras. Of the 989 towers that once populated peaks throughout Idaho, only 196 still stand. Many simply rotted away. Less than a third are still staffed statewide, only six in Priest Lake Ranger District, some of them co-managed with Newport Ranger District. Aunan has numerous stories about small fires that could have gone either way. Once she was on the east side of Lookout Lake and saw smoke in the distance. She yelled in case it was campers and radioed in. Air patrol didn’t see the fire but her crew came in anyway, spotted the fire and dealt with it. “I was so proud of my people,” said Aunan. “We work together but everyone wants to be first on a fire.” And, she adds, it’s also important to be correct; no one wants to call a fire on campers. Another time, said Aunan, she was leaving the tower, knowing a crew was en route. It was dusk and she was alone in the forest. She saw a small fire ahead, the trees lit like little sparklers and she remembers thinking to herself: “If I die tomorrow, I got to see one of the coolest things ever.” She made it out just fine, but the memory stays with her.